Like Buddha, some of the most sacred images in South East Asia have been good travellers during their 'lives'. The Emerald Buddha, now the most sacred Buddha image in Thailand, and the revered and unique black reclining Buddha at Wat Xieng Thong in Luang Prabang are examples. The Thai image, known in Thai as Phra Kaew, now resides in the Wat Phra Kaew adjoining the grounds of the Grand Palace in Bangkok. The image and the rituals that surround it are so important to the Thais that they are regarded as legitimating the Thai monarchy  the king plays a central role in changing its robes at the start of the three main seasons  and the Thai nation. It is kept high above the floor of the chapel and no photography is allowed. Underlying the presence of 60cm-high image is a mystery about its origin. Legend has it that it started its travels in India, where it was carved of a green material  possibly jade or jasper  and reach Thailand along the southern route via Sri Lanka. Some, however, believe it may have been carved in Thailand around the 14th century. The first records of the Emerald Buddha date back to the 15th century, when it as covered in plaster and goldleaf and kept hidden in Wat Phra Kaew in the northern Thai town of Chiang Rai. Buddhist history says that in 1434 lightning struck the wat's chedi and the damage revealed the plaster-covered Phra Kaew  not an unfamiliar story of valuable images being hidden from marauding enemies. Later, apparently, the plaster was washed off by rain and the full glory of the Emerald Buddha was revealed. 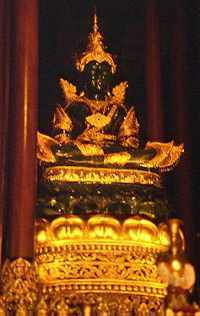 (A copy of the Emerald Buddha, accurate to within a few millimetres, was carved a decade ago and can be seen in Chiang Rai's Wat Phra Kaew or the new temple, Haw Phra Kaew. The new image is pictured right). The revelation of the Emerald Buddha's true form clearly brought about mixed fortunes because the next documented evidence puts the Phra Kaew in another Wat Phra Kaew, this time in Lampang, 150 miles south of Chiang Rai, and then it was taken north again to Chiang Mai. Far more harrowing for the Thais, the Phra Kaew was carried off to Luang Prabang by Laotian invaders in the middle of the 16th century. But even there it was not kept, and with the Phra Bang in residence and generating an interest in Buddhism which swept the country, it was not even the most revered image. The north-eastern town of Luang Prabang  on the bank of the Mekong which provided the only practical way to reach it  was once the royal capital of Laos. But the capital was moved to Vientiane in the mid-16th century, and that became the next destination for the Phra Kaew. It was not until two centuries after its capture that the Thais won it back in yet another war in this notoriously unstable area. The Phra Kaew was moved again, this time to the old Thai capital of Thonburi on the west side of the Chao Phraya river which bisects modern-day Bangkok. There it was kept in a wat on the site of today's Wat Arun, the Temple of the Dawn that is visited by every tourist who finds a way to the City of Angels. Then, in 1782, the first year of Bangkok as the new capital, the Emerald Buddha was moved across the river to the newly-built Wat Phra Kaew temple  where it can be seen today. 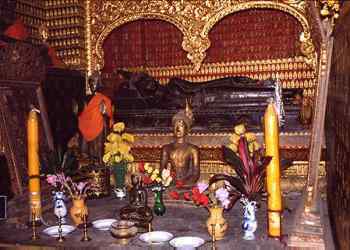 The reclining Buddha (pictured top) at Wat Xieng Thong in Luang Prabang has travelled far further than the Phra Kaew, though not as often or as hazardously. The unique, black image  perhaps 10ft long and very heavy  was carved around 1560, the year that Wat Xieng Thong was consecrated and taken into royal patronage. It survived the violence of the years until, in 1931, the French  by then the colonial masters  decided to ship it home for the Paris Exhibition. The image, in classic Lao style rather than the more common imitations of Thai styles, has a rare beauty from its head, where a hand extends gracefully away instead of merely supporting the head, to the feet, where the flowing monastic robes curl away from the ankles. When the image had intrigued the French masses sufficiently, it was returned to Laos. But to Vientiane rather than Luang Prabang. It was not until 1964 that the image  depicting Buddha leaving the human world for parinbbana, the final release from the cycle of life, suffering and death  was returned to Wat Xieng Thong. Today, you can see it back in what the French called La Chapelle Rouge just to the rear and side of the main temple of Xieng Thong.